We’d love your help. Let us know what’s wrong with this preview of Glitter by Stella J. Jones. Gloria the rhino LOVES glitter. She has glitter slippers and a glitter scooter, and she spreads her sparkles wherever she goes; here, there, and everywhere! The townsfolk, though, are tired of it. No more glitter, Gloria! they tell her. But soon, the entire town is covered in glitter. What will everyone think now? To ask other readers questions about Glitter, please sign up. This book is chock-full of glitters! Like in every way, as there is glitter not only in the story but also on the pages, on the characters. Yep, the book is very shiny. Gloria is going through her little hometown and she spreads glitter everywhere. On everyone. You can imagine that at first people aren't that amused, but then they see the joy of glitters. How it brings people together as glitter really sticks to everything and everyone. It was all very cute, a Glitters, sparkles, razzle-dazzles! Gloria is going through her little hometown and she spreads glitter everywhere. On everyone. You can imagine that at first people aren't that amused, but then they see the joy of glitters. How it brings people together as glitter really sticks to everything and everyone. It was all very cute, and I was delighted that people also saw the happiness of glitter. How can you get angry when everything is so sparkly and colourful? I love how the story rhymes. Some of the rhymes had me in stitches. It was fun to see the whole town, to see the stores, to see people walk around (or bike). I wish I could just step into the book and dance in glitter as well. The town seems like such a happy place. The illustrations were so cute. Plus again, I just love that they added glitters on every page. C'mon - there's GLITTER on every page!! Glitter, as every children's librarian, gets everywhere once you use it. Does that mean you should stop? Of course not! I must use this book in storytime with a glitter craft at the end. What children's librarian can read this book and not be amused? We've all worked with glitter, and we all know how it spreads to everything. And, being as how I'm a magpie, I liked finding sparkly bits on every page. For some reason, I was highly entertained by the two-page spread of the animals laughing, because of the lion's teeth. This review has been hidden because it contains spoilers. To view it, click here. Gloria loves glitter. Glitter is messy. Glitter gets all over the town. Towns people are about to get mad but the power of glitter overpowers them and they become happy. Take away: Glitter is messy but its sparkly essence makes people happy. I'm going to be like Gloria and let everybody know MY favorite color is glitter! And I love how the book didn't shy away from how tenacious glitter can be once it "escapes" from its project or container. Glitter, glitter, everywhere! 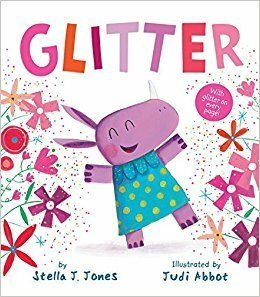 Gloria the rhino loves glitter, and she spreads it all over town in this book (which is, also, covered in glitter). Good for young children who love silliness and, especially, glitter. Story about rhino spreading glitter (& happiness) everywhere she goes. Actual glitter on the pages. Some rhyming involved. I LOVED this book! Gloria's favorite color is glitter and she spreads it where ever she goes. At first the townspeople are upset but it ends on a good note. A great elementary read aloud. Great read-a-loud and very sparkly. Yay for GLITTER! This is such a fun and happy book! I didn’t love all the illustrations, but every page with SPARKLE was fantastic and lots of beautiful colors. Definitely a book I need to own! This is a cute story about a girl who loves glitter. Really cute book. My daughter loved it and the sensory fun of running her fingers over the texture of the glitter. She loved naming the different animals too. Gloria spreads her glitter all over town. At first, everyone's angry, but the more the glitter spreads, the happier everyone gets. For all the "glitter-philes" and those that have to / get to live with them! Also for the tactilely-inclined -- there is glittery texture that won't rub off with repeated touching. Yeah! I thought this book was super cute, fun and dare I say, "Glittery?" I love that her favorite color is Glitter! I think this book will appeal to girls but boys will really like it too! Fun one! Perfect for glitter lovers. I love that the main character is a rhino. Fun basic graphics. Storyline was fine but writing could have been stronger. Gloria spreads glitter and glee throughout her community; glitter patches add a touch of razzle-dazzle to each page. I like the mix of prose and rhyme, and the textured glittery parts of each page are a fun feature. But the story is a bit flat. Everything just sort of works out without much conflict. I love glitter and especially the glitter on the book (which is on the cover and on every page as advertised) because this glitter does not spread like it does in the story. Super cute. Gloria the rhino LOVES glitter. She has glitter slippers and a glitter scooter, and she spreads her sparkles wherever she goes. The townsfolk, though, are tired of it. "No more glitter, Gloria!" they tell her. But soon, the entire town is covered in glitter. What will everyone think now? Subject: Rhinoceroses -- Juvenile fiction. Glitter art -- Juvenile fiction.